[159 Pages Report] The corn wet-milling market is projected to grow from USD 58.09 billion in 2015 to USD 77.50 billion by 2021, at a CAGR of 5.0% from 2016 to 2021. Increased demand for corn-based sweeteners such as high-fructose corn syrup in processed food & beverages, consumption of corn gluten meal-based feed products, and rise in demand for biofuels such as ethanol is expected to drive the corn wet-milling market. The base year considered for the study is 2015, and the forecast has been provided for the period between 2016 and 2021. Increased demand for HFCS in the carbonated beverage industry owing to its 55% fructose content, which makes it sweeter compared to sucrose, resulting in low production cost for manufacturers. Since HFCS is the key product manufactured in the wet-milling process, increase in its demand is expected to drive the market for corn wet-milling in the near future. The global beverage industry is expected to rise significantly irrespective of the global economic downturn. This increase in the sales of ready-to-drink beverages which include products such as carbonated & dairy beverages, tea, fruit drinks, and alcoholic beverages such as beer, ciders, and malted beverages is the key factor leading to increased demand for HFCS. 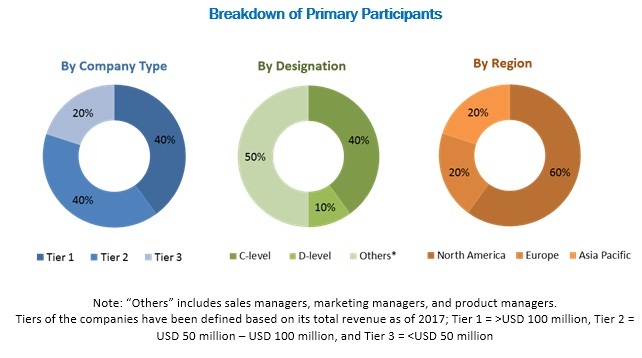 During this research study, major players operating in the corn wet-milling market in various regions have been identified, and their offerings, regional presence, and distribution channels have been analyzed through in-depth discussions. Top-down and bottom-up approaches have been used to determine the overall market size. Sizes of the other individual markets have been estimated using the percentage splits obtained through secondary sources such as Hoovers, Bloomberg BusinessWeek, and Factiva, along with primary respondents. The entire procedure includes the study of the annual and financial reports of the top market players and extensive interviews with industry experts such as CEOs, VPs, directors, and marketing executives for key insights (both qualitative and quantitative) pertaining to the market. The figure below shows the breakdown of the primaries on the basis of the company type, designation, and region considered during the research study. Key players considered in the analysis of the corn wet-milling market are Tate & Lyle PLC (UK), Archer Daniels Midland Company (US), Cargill, Incorporated (US), Ingredion Incorporated (US), Agrana Beteiligungs-AG (Austria), The Roquette Freres (France). Other players include Bunge Limited (US), China Agri-Industries Holding Limited (China), Global Bio-Chem Technology Group Company Limited (Hong Kong), and Grain Processing Corporation (US). In July 2016, ADM introduced high-quality protein source PROPLEX DY for swine feed. This product was produced from the corn wet-milling process and was to improve the growth of animals. In February 2016, ADM acquired Morocco-based corn wet mill from Tate & Lyle (UK). This would help ADM to produce glucose and native starch. In January 2016, Cargill set up its new corn wet-milling plant in Karnataka, India by investing USD 100.0 million. The plant's capacity was to provide 800 tons of corn daily. In February 2016, Ingredion Incorporated acquired Shandong Huanong Specialty Corn Development Co., Ltd (China), to enhance its growth in the Asia Pacific region and generate a manufacturing base for specialty ingredients. What are new application areas which the corn wet-milling companies are exploring? 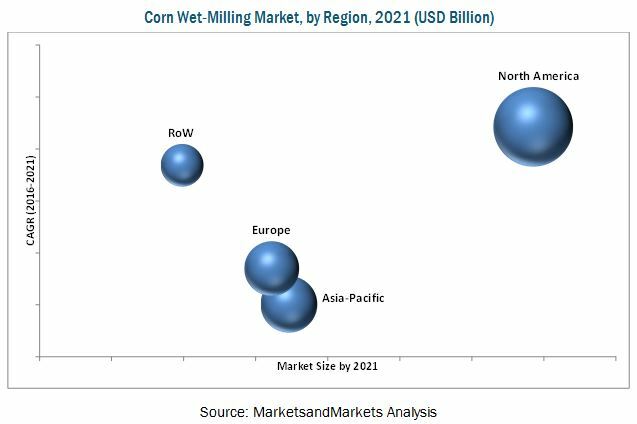 The overall corn wet-milling market is expected to grow from USD 58.09 billion in 2015 to USD 77.50 billion by 2021, at a CAGR of 5.0% from 2016 to 2021. The increased demand for corn-based sweeteners such as high-fructose corn syrup in processed food & beverages, increase in consumption of corn gluten meal-based feed products, and increased demand for biofuels such as ethanol are the key factors driving the growth of this market. The corn wet-milling market has been segmented, on the basis of the end product, into sweeteners, gluten feed & gluten meal, ethanol, starches, and others. The market for sweeteners is expected to grow at the highest CAGR between 2016 and 2021. Among all the end products, sweeteners are the most widely used in the food & beverage as well as the pharmaceutical industry. The corn wet-milling market has been segmented, on the basis of application, into feed, food, and industrial. The market for feed application is expected to grow at the highest CAGR between 2016 and 2021. Among all the applications, corn wet-milling is used the most in the feed industry owing to demand for abundant, safe, and affordable animal protein. Apart from this, increased demand for meat such as poultry, swine & beef, dairy, and fish especially in emerging economies such as Asia Pacific, South America, and the Middle East & Africa are expected to create high growth prospects for corn-wet milling producers in the coming years amidst rise in income among individuals in these regions. The corn wet-milling market has been segmented, on the basis of source, into dent corn and waxy corn. The market for dent corn is projected to grow at the highest CAGR between 2016 and 2021. 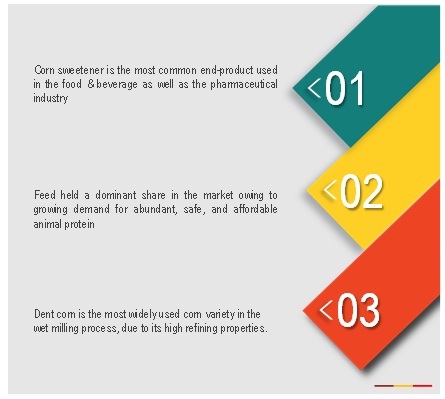 Among both the sources, dent corn is the most commonly used corn in corn wet-milling process to manufacture corn syrup, food starch, feed, and ethanol. The corn wet-milling market has been segmented, on the basis of equipment, into milling equipment, steeping equipment, centrifuge systems, washing & filtration systems, and others. The centrifuge systems are projected to grow at the highest CAGR between 2016 and 2021. They are the most widely used widely used equipment in the corn wet-milling market. The corn wet-milling market in North America is expected to grow at the highest CAGR during the forecast period. North America is the fastest-growing and largest market for corn wet-milling products. It held a major share in the ethanol segment, which is obtained from the corn wet-milling process. Corn wet-milling products are used in various industries such as food, feed, textiles, paper, pharmaceuticals, personal & healthcare, and others. This is the major factor driving the growth of the corn wet-milling market in North America. Apart from this, the region is home to a number of multinational food processing giants such as ADM (US), Cargill (US), and Ingredion (US). The region is also the largest consumer market at a global level for corn products. As a result, North America holds a significant share of the overall corn wet-milling market. The end products of the corn wet-milling process such as corn gluten meal, corn gluten feed, corn germ meal, corn steep liquor, and amino acids are used in feed. Corn gluten is used in dairy & cattle, poultry, and swine feed while corn steep liquor is beef and dairy feed ingredients. Increased demand for meat such as poultry, swine & beef, dairy, and fish in countries such as China and Brazil are expected to boost demand for feed in these countries, thus driving the corn wet-milling market. The major food ingredients obtained from corn wet-milling process are corn syrup, corn starch, and corn oil other co-products include organic acids, vitamins, amino acid, citric acid, lactic acid, and food gums. Corn syrup can be used as a sweetener in food items such as candies, ice creams, confectionery, and infant formula. High-fructose corn syrup is used in various consumer products such as baked goods, dairy products, fruit-flavored beverages, and soft drinks. Cornstarch is used in various instant and ready-to-eat foods to maintain the textural characteristics during heating, thawing, and freezing. It is also used in jellies, candies, and food sauces. The products obtained from refined corn oil are cooking oil and salad oil, which are used in salad dressings to provide health benefits with concentrated energy content. It is also used to produce margarine, mayonnaise, and other such condiments. The products obtained from the corn wet-milling are used in application that serves industries such as textile, paper, personal care, and pharmaceuticals. In the paper and textile industry, industrial corn starch is used for surface coating, sizing, and adhesion. It is also used in the production of construction material, mining, oil & gas drilling, and water filtration. Starch is also used in household items such as batteries, cleaners, matches, and trash bags. It also serves the personal and healthcare industry as an ingredient in items such as cosmetics, soaps, deodorants & hair styling products, medicines, and cough drops. Apart from this, corn starch is used in diapers, bandages, napkins, and baby powders. It can be used as an adhesive to replace petroleum-based acetates. It is also used as a raw material for the production of industrial chemicals and plastics, a relatively new market for cornstarch. What are the upcoming industry applications for corn wet-milling? The major restraining factor in the corn wet-milling market is the high cost of operations. Corn wet-milling is a highly energy-intensive processing technology in the food & beverage industry and consumes approximately 15% of the total energy used in the entire food industry. Among raw materials, energy cost is the second-largest after corn prices in the wet-milling process. Furthermore, high energy-price volatility adds on to the variable cost of the wet-milling process resulting in reduced predictable earnings for millers. The amount of energy consumed in the milling industry is growing, which in turn restrains the market growth. Key players in the market include Tate & Lyle PLC (UK), ADM (US), Cargill (US), Ingredion Incorporated (US), Agrana Beteiligungs-AG (Austria), The Roquette Freres (France). Other players include Bunge (US), China Agri-Industries Holding Limited (China), Global Bio-Chem Technology Group Company Limited (Hong Kong), and Grain Processing Corporation (US). Figure 22 Market Segmentation, By Application.